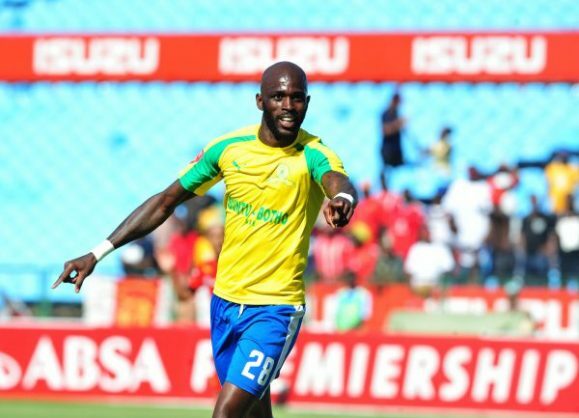 Mamelodi Sundowns striker Anthony Laffor is confident his side will win tonight’s Caf Champions League match against AS Togo-Port. Sundowns host AS Togo at the Lucas Moripe Stadium tonight at 9pm. Laffor, who did not feature in the 1-0 loss away match in Lome against the same opponents, is confident that Sundowns will get the result tonight. “Every player wants to play. I am just happy that I have been given the opportunity to play for Sundowns again,” Laffor told the media. “So, I just need to keep my feet on the ground and listen to what my coaches want me to do – respect my teammates, and whenever I get a chance, I just want to make things happen,” the Liberia international added. “It’s difficult, every game is like a cup final. We need to win our two games before going to Morocco, because you guys (the media) didn’t put us in this situation, we put ourselves in this,” Laffor explained. “The only thing we can do now is to win our two home games which we can do. And how we can do it is by working on the field and listening to what our coaches want us to do,” Laffor said. “So, we got to cross that bridge on Friday, then we can see how best we can play the team from Guinea,” he continued. “The difference now is our last campaign, we didn’t lose a game. But now, we lost our last game in Togo, that’s the only difference,” he recalled. “But Sundowns is a good team, we know that we can bounce back. We believe in ourselves, but talking is different from doing on the pitch. We just need to do it on Friday, I believe that we can do it. We should stick to our game plan, because in Togo we missed chances. “So, the chances we missed in Togo, if we get that on Friday and if we can put that into use, we can be victorious,” Laffor concluded.